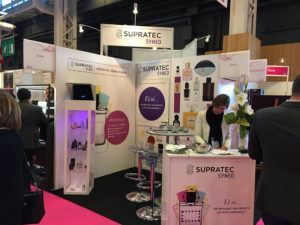 This year’s packaging exhibition of perfume, cosmetics & design (PCD) in Paris on 18th & 19th January reached new heights with a changed date, new venue and very high visitor numbers. Between 420 exhibitors from 70 different countries there was also preeflow`s French distributor SUPRATEC Syneo, who was very satisfied after these two days of exhibiting. They did some demonstration with the eco-PEN, as well as they introduced their new SUPRATEC Syneo Logo. SUPRATEC Syneo offers its expertise in industrial bonding process. They dedicate to improve assembling processes by using their technical adhesives and dispensing equipment to make it more resistant, more practical, faster, more aesthetic or more economical. Their work methodology includes collaborative work with the client. SUPRATEC Syneo carries out tests with the teams to validate the solution, whether in their laboratory in Bondoufle or on customer manufacturing lines.They offer complete support from the specifications to the start-up of the system, throughout the lifetime of the product.